How do I register for a class or bring a workshop to my group? Physical self-defense: techniques to end a physical attack and get to safety. 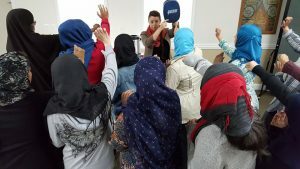 We learn these techniques through discussion, role-plays, exercises, and more. This is not a martial arts class. You won’t have to practice for hours to learn practical skills. Even after the first class or a short workshop, you will go home with techniques you can use if you need to. Check our current schedule, and if you don’t see what you’re looking for, contact us to let us know and we can make it happen! A Defend Yourself teacher leads a class at a Maryland mosque. Check our schedule of upcoming classes. Or learn about bringing Defend Yourself to your workplace, community group, Girl Scout troop, etc. Call us at 301-608-3708 or e-mail us. Lead instructor Lauren Taylor has studied and taught self-defense since 1985. She holds the rank of black belt in tae kwon do, a traditional Korean martial art. She specializes in teaching self-defense to women, to people with disabilities, to LGBTQ people, and to survivors of abuse and assault. She and other Defend Yourself instructors all have training in self-defense and teaching. Call Lauren Taylor at 301-608-3708 or e-mail her. We’re happy to talk and answer any questions you have!